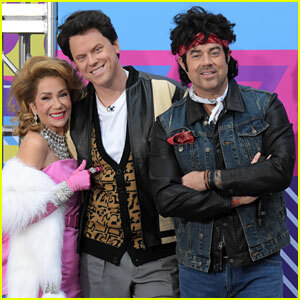 The co-hosts of the Today show dress up as iconic figures from the 1980s for Halloween! Kathie Lee Gifford, Willie Geist, and Carson Daly snapped a pic together on Wednesday (October 31) in New York City. Kathie went as Madonna in her “Material Girl” music video. Willie channeled Matthew Broderick‘s Ferris Bueller in Ferris Bueller’s Day Off. Carson dressed up Bruce Springsteen. Al Roker and Dylan Dreyer went as Christopher Lloyd and Michael J. Fox’s Back to the Future characters, Dr. Emmett Brown and Marty McFly. Craig Melvin channeled Eddie Murphy’s Prince Akeem from Coming to America. Sheinelle Jones dressed up as Tina Turner. Savannah Guthrie went as Cyndi Lauper. Hoda channeled Elton John. Peter Alexander and Jenna Bush Hager dressed up as Tom Cruise and Anthony Edwards’ Top Gun characters, Maverick and Goose. Sunny the dog even channeled Cher! See all the costumes in our gallery below.